On June 29, the Feast of Saints Peter and Paul, Patron Saints of Rome, the Pope’s Almoner and new Cardinal Konrad Krajewski invited the needy to a celebration meal at the Vatican. The meal took place in the Refectory of the Holy See’s employees. The Pope arrived by surprise around 6:30 pm and dined with the joyful assembly. The feast brought together some 260 people with the Papal Almoner, the new Cardinal Konrad Krajewski, who welcomed Pope Francis. At table with them were some 40 parents and Polish friends of the new cardinal. 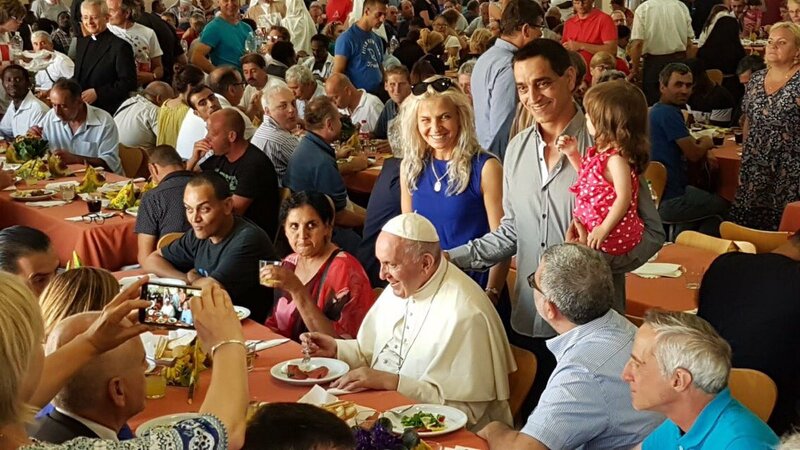 The guests were served by volunteers who work with the Office of Papal Charities, permanent deacons and Sisters of Mother Teresa who distribute meals to people in difficulties and the homeless of Roman stations.